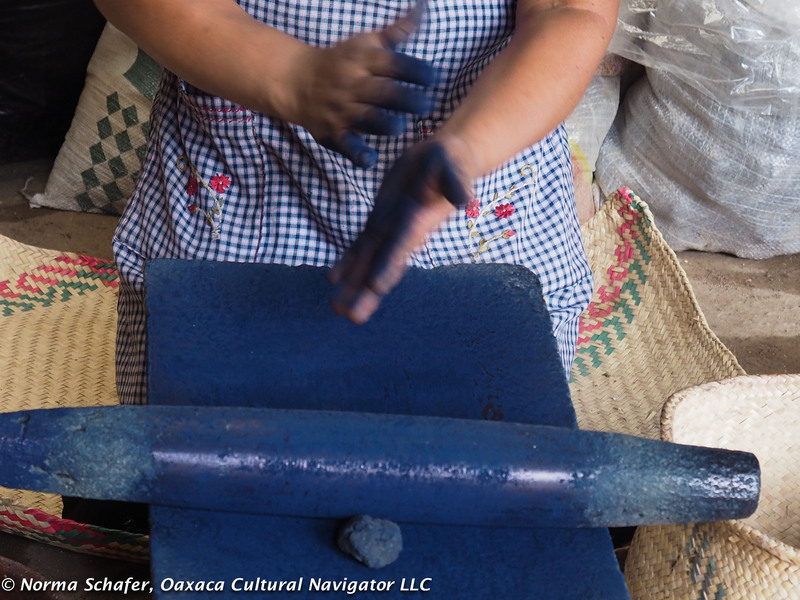 This post continues the narrative about women weavers in Teotitlan del Valle, Oaxaca. See Part One for my introduction. Honoring Mother’s Day: For all women who gave and received life! Twenty years ago, Vida Nueva cooperative was founded by six single women from the same extended family group, three of whom where sisters. Some of the women had husbands who never returned to Teotitlan del Valle, Oaxaca, after migrating out for work. Some had not married. Some were widows. They needed to support their families and weaving had the biggest potential economic reward for their labor. But, weaving was not women’s work. The traditional role for women was (and still is, for the most part) to stay at home, keep house, tend the children, cook and raise small animals like chicken, sheep, pigs and goats. Twenty years ago, weaving and then selling/marketing the product was not a usual role for women, plus it was unheard of to go to the city to develop customers. Most women of the time went barefoot, wore indigenous dress and did not go beyond the family compound expect to daily market. Entering the city was foreign, uncomfortable, intimidating. Since the height of the Bracero program, when men migrated to the U.S. as temporary farm workers, and women learned to weave out of economic necessity, the number of women who now weave is substantial. Today, most women work alongside husband, father or brother, to weave in a family centric enterprise. A few also participate in selling and receive recognition for their contributions. It took a while for Vida Nueva to get started, but they had the help of a non-governmental agency, Grupo del Apoyo a la Educacion de la Mejor (now defunct). 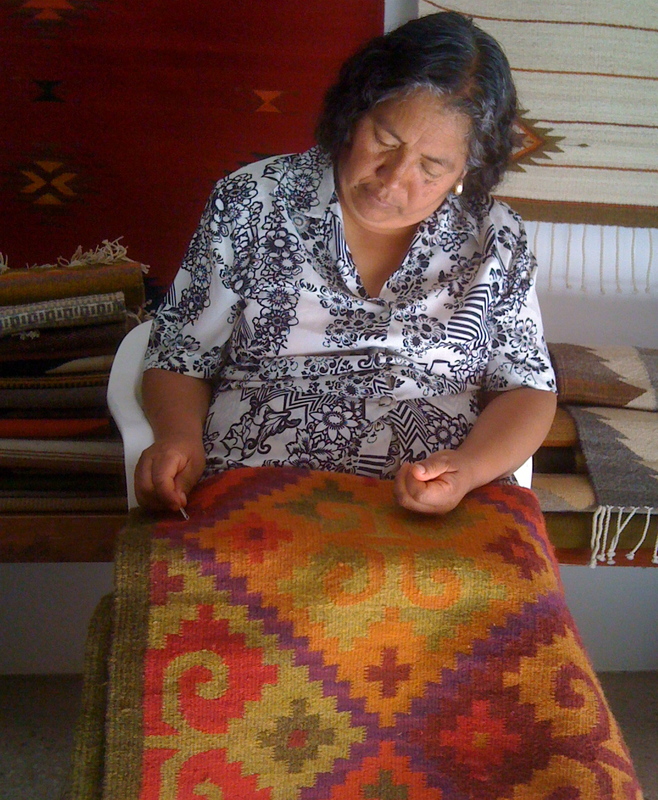 Through donations and business development guidance, Vida Nueva began producing rugs for sale in 2001. Their first clients, arranged by the NGO, were adult Spanish language students who were visiting Oaxaca from the United States. The cooperative meets regularly, makes decisions together, created a mission statement, a vision, goals and objectives for the organization that includes a marketing plan, and have built distribution markets over time. They also put money aside each year to invest in an annual community project that can benefit everyone in Teotitlan del Valle. 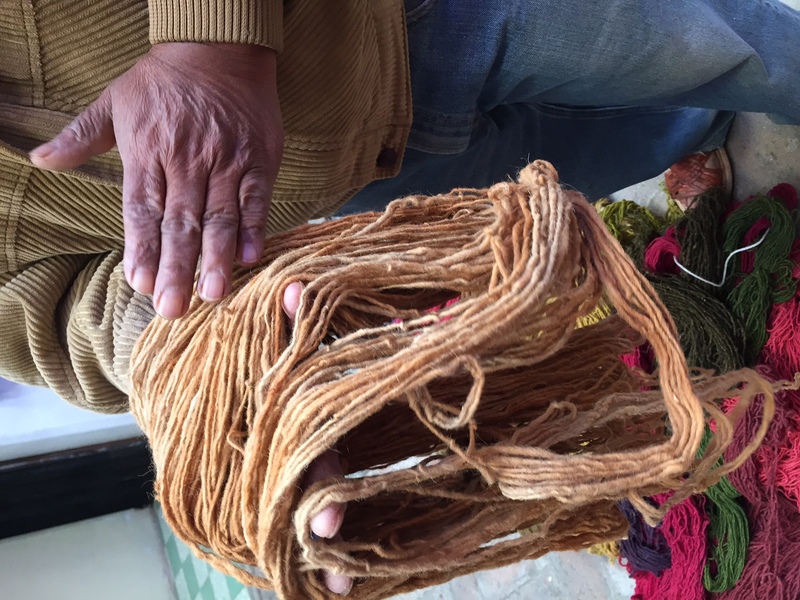 Not all the rugs woven by Vida Nueva are made with natural dyes. Most are woven with synthetic colors because most buyers don’t want to pay the price for a naturally dyed rug and prefer bright, electric colors. But, the cooperative will do custom orders for naturally dyed rugs and from time-to-time, may have some on-hand. Today there are 12 cooperative members, two of whom are married. Their clientele has developed by word of mouth over the years, and they also have been invited to participate in shows/sales in the U.S.A. including the International Folk Art Market and the Feria at Lake Chapala, Mexico Arts Show. Our yoga guide Beth Miller gathers us around her in a circle. We sit on chairs, backs tall. At the head of the room is the traditional Zapotec altar complete with candlesticks and an incense burner ready for the next celebration. Forefinger touches thumb to form a circle. We rest arms on knees, close our eyes, take a deep breath and then another. Inhaling yet again, deeper, each of us releases sound from within, from the center of our being. From the third eye, to the throat, to the heart, to the belly, to the secret chakra of the woman’s womb, the place where we release the child from our bodies, whether real or imaginary. Beth will be teaching this summer, July 5-11, in Teotitlan del Valle. We sing clear, mouths open, full. It does not matter if one or the other of us cannot carry a tune. There is no shame in our voices as we expel the breath and accompanying sound. It fills the room and the walls reverberate. The sound is another sister and it envelops us. Elena Gutierrez, in whose home we practice this vocal yoga, tells us we sound like a sacred ashram. The melodies we chant become integral to the creative energy we develop as each day passes. The sound gives us connection, power, peace, and allows us to lift our creative voices high. With hands put together in the prayer of honoring each other, we bow and leave the room in silence. This silence is sparkling clean. Bird sounds are amplified. The cup placed onto the tablecloth is an act of intention. The table vibrates slightly to receive it. Next is the taste of crunchy fresh tortillas soaking up spicy black bean paste topped with slivers of sweet white onion, translucent. A sprinkle of chopped fresh cilantro and queso fresco like white paint splattered on a black canvas adorns the morsel. My spoon cuts and I lift spoon to mouth, taste the crunch again, the corn ground by Magda’s able hands, formed in her palms, toasted on the comal in the courtyard, turned four times by fingers old enough to tell the story of eternal woman. The black heat of bean paste smeared on tiny tortilla, the crunch of corn with cilantro punctuation are full in my mouth. My tongue receives them like a host, hot flame of spice engulfs my mouth, a vessel holding the flavors of earth.